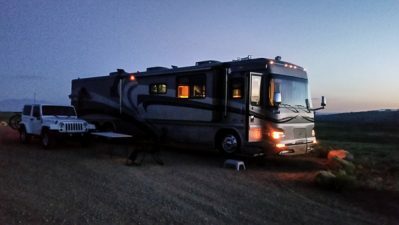 Boondocking on BLM land about 7 miles outside Goblin Valley State Park for four days is our plan after leaving Moab. With no internet (cell service at 1G maybe) and no TV reception at all, we plan to nap repeatedly and consistently to rest up from the fast paced social life of Moab. Day One – I am enjoying an afternoon doze when Storm blasts into my dreams by initiating the Emergency Slide Retraction Sequence. The ESRS is a complicated procedure in which one of us urgently implores (read yells at) the other one to rush outside and bring in the slides before the toppers rip off in high wind. Storm normally refuses to participate claiming that the toppers “will be OK” so I know this is serious. After narrowly avoiding disaster, dreamland evades me until the storms pass us by and the coach finally stops violently rocking back and forth . Our first visit to the park itself is in mid-afternoon a day later. At 90 plus degrees, the goblins are scorching and no fun for playing. We return to the coach to cool off before venturing out in the sunset air. We check with the park office on our way out and learn that drone flights are allowed in the park. When we return at sunset, Storm finds a remote spot in the park to record the following aerial visit to Goblin Valley State Park. Why are you the only person in the park? This would cause me concern so I thought I would inquire. Well this park is very, very, very remote and pretty big. There were a couple of cars of folks there but we were far from them. Need to be on your survival instinct toes here! Plenty of water and Don’t fall off the Goblins! Thanks! We were pretty much alone out there. I will pass along the kind words to Storm. I agree, he is getting much better at working with the drone!